Maria Branwell was born in Penzance, Cornwall, on 15th April 1783. 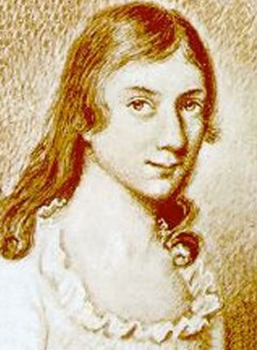 She was the eighth of eleven children (only six survived to adulthood though) of Thomas Branwell, a successful merchant, and his wife Anne Carne. The family owned many properties in the town and was involved in local politics (her brother Benjamin became the town’s Mayor in 1809). They were also Methodists and helped build the first Wesleyan Methodist Chapel in Penzance. A plain and petite woman, Maria made friends easily. She was well-read, intelligent, witty and pious. She also wrote “The Advantages of Poverty, In Religious Concerns”, but it was never published. When her parents died, Maria had to look for a job. In 1812 her aunt Jane Fennell, who was housekeeper at the Woodhouse Grove School at Rawdon in Yorkshire, invited Maria to assist her. Maria accepted and left Penzance to start a new life. John Fennell, Jane’s husband and Maria’s uncle, was a methodist minister and the headmaster of the school. In 1812 he invited his former colleague Patrick Bronte to visit the school. Here, he met Maria and after a short courtship the couple were married on 29th December 1812. It was a double ceremony as John and Jane’s daughter, Jane Branwell Fennell, also got married to the Reverend William Morgan. On that same day, but in Penzance, Joseph and Charlotte Branwell, two cousins of the brides, got married as well. The couple first lived in Clough House, Hightown, where their first two children Maria (1814) and Elizabeth (1815) were born. In 1815, the family moved to Thornton, where the rest of their children was born: Charlotte (1816), Patrick Branwell (1817), Emily (1818) and Anne (1820). In 1820 the family moved again, this time to Haworth. Maria didn’t enjoy her new house much though as within a year she developed cancer and died on 15th September 1821.